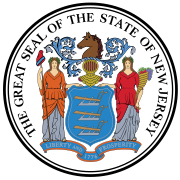 Elections in New Jersey are authorized under Article II of the New Jersey State Constitution, which establishes elections for the governor, the lieutenant governor, and members of the New Jersey Legislature. Elections are regulated under state law, Title 19. The office of the New Jersey Secretary of State has a Division of Elections that oversees the execution of elections under state law (This used to be the New Jersey Attorney General). In addition, the New Jersey Election Law Enforcement Commission (ELEC) is responsible for administering campaign financing and lobbying disclosure. Historically, it has voted about half the time, nationally, for each of the two major parties since 1860. Traditionally a swing state, It has voted Democratic in recent decades. The governorship has alternated between the two major parties since the election of Democrat Richard J. Hughes in 1961, with a succession of Republicans and Democrats serving as governor. The New Jersey Legislature has also switched hands over the years, and one house was evenly divided from 1999–2001, when the Democrats took control. Three of the last four gubernatorial elections have been close. New Jersey leans Democratic in national elections. The Congressional seats have been as evenly divided over the decades, with little change due to political trends in the state. New Jersey currently has a Democratic governor, Phil Murphy and recently elected their second lieutenant governor, Democrat Sheila Oliver. At the national level, the state favors the Democratic Party: Both of its Senators have been Democrats since 1982, and George H.W. Bush was the last Republican candidate for President to carry the state, in 1988. However, previous governor Chris Christie was a Republican serving from 2010 to 2018, as was Christine Todd Whitman, who served from 1994 to 2001. New Jersey is split almost down the middle between the New York City and Philadelphia television markets, respectively the largest and fourth-largest markets in the nation. As a result, campaign budgets are among the largest in the country. In 1776, the first Constitution of New Jersey was drafted. It was written during the Revolutionary War, and was created a basic framework for the state government. The constitution granted the right of suffrage to women and black men who met certain property requirements. The New Jersey Constitution of 1776 allowed "all inhabitants of this Colony, of full age, who are worth fifty pounds proclamation money" to vote. This included blacks, spinsters, and widows; married women could not own property under the common law. The Constitution declared itself temporary, and it was to be void if there was reconciliation with Great Britain. Both parties in elections mocked the other party for relying on "petticoat electors" and accused the other of allowing unqualified women to vote. The second version of the New Jersey State Constitution was written in 1844. The constitution provided the right of suffrage only to white males, removing it from women and black men. Some of the important components of the second State Constitution include the separation of the powers of the executive, legislative, and judicial branches. The new constitution also provided a bill of rights. The people had the right to directly elect the governor. In national elections, the New Jersey has recently leaned towards the national Democratic Party. For much of the second half of the 20th century, New Jersey was one of the most Republican states in the Northeast. It supported Republican presidential candidates in all but two elections from 1952 to 1988. It gave comfortable margins of victory to the Republican candidate in the close elections of 1948, 1968, and 1976. New Jersey was a crucial swing state in the elections of 1960, 1968, and 1992. However, the brand of Republicanism in New Jersey has historically been a moderate one. As the national party tilted more to the right, the state's voters became more willing to support Democrats at the national level. This culminated in 1992, when Bill Clinton narrowly carried the state, becoming the first Democrat to win it since 1964. Since then, the only relatively close presidential race in New Jersey was in 2004, when Democrat John Kerry defeated George W. Bush in New Jersey by a margin of about seven percentage points. Clinton won it handily in 1996, and Al Gore won it almost as easily in 2000. In the 2008 and the 2012 presidential election, Democrat Barack Obama carried the state by more than 15 percentage points. Hillary Clinton won it by over 14 points in 2016. Indeed, the 2004 election is the only election in recent years where the race hasn't been called for the Democrat soon after the polls closed. As a result, at the presidential level New Jersey is now considered part of the solid bloc of blue states in the Northeast. The most recent victory by a Republican in a U.S. Senate race in the state was Clifford P. Case's reelection in 1972. Only Hawaii has had longer periods of exclusive Democratic victories in U.S. Senate races. The last Republican to hold a Senate seat from New Jersey was Jeffrey Chiesa, who was appointed a U.S. Senator by Governor Chris Christie in 2013 after Democrat Frank Lautenberg died in office. Chiesa served four months in office and did not seek election in his own right. After Kean won the biggest victory for a gubernatorial race in New Jersey in 1985, no Republican ever won 50 percent of the vote in a New Jersey election for three decades until Chris Christie was re-elected in 2013 with 60% of the vote. Christine Todd Whitman was elected governor with 47 percent of the vote in 1993 and with 49 percent in 1997. On November 3, 2009, incumbent Democratic Governor Jon Corzine was unseated by Republican challenger Chris Christie. Christie's margin of victory was 49%-45%. Four years later, Christie was reelected with 60 percent of the vote, becoming the first Republican to clear the 50 percent mark since 1985. As New Jersey is split almost down the middle between the New York City and Philadelphia television markets, advertising budgets for statewide elections are among the most expensive in the country. The state's Democratic strongholds include Mercer County around the cities of Trenton and Princeton; Essex and Hudson counties the state's two most urban counties, around the state's two largest cities, Newark and Jersey City; as well as Camden County and New Brunswick/Middlesex County and most of the other urban communities just outside Philadelphia and New York City. The northeastern and southwestern counties, with over two million voters between them, have made it extremely difficult in recent years for a Republican presidential candidate to carry New Jersey. In 2004, for instance, Bush lost the state largely due to being completely shut out in those areas. The state's more rural to suburban northwestern and counties are Republican strongholds, especially mountainous Sussex County, Morris County, Hunterdon County and Warren County. Somerset, a more rural northwestern county, also leans Republican but can be competitive in national races. In the 2004 presidential election, Bush received about 52% in Somerset and 60% in Hunterdon, while in rural Republican Sussex County, Bush garnered 64% of the vote. Parts of rural to suburban northwestern Bergen and Passaic counties which are also mountainous, are also usually Republican. The southeastern counties along the coast also favor Republicans, notably Ocean County, Monmouth County, and Cape May County. However, Atlantic County, which includes urban Atlantic City, has recently swung Democratic in national elections. About half of the counties in New Jersey, are considered swing counties, though most lean toward one party, usually the Democrats. For example, Bergen County is solidly Republican in the wealthier and in some places rural and mountainous north and solidly Democratic in the more urbanized south. Due to the influence of the south, Bergen County has not gone Republican in a presidential election since 1992. The same is true of Passaic County which has a densely populated, heavily Hispanic Democratic south and a rural Republican north. Some other counties such as Salem County lean Republican because the urbanized areas in those counties are relatively small compared to those of the more heavily Democratic counties. Statistically, Atlantic County is the most representative county. Unaffiliated is a status for registered voters in New Jersey. Those voters who do not specify a political party affiliation when they register to vote are listed as unaffiliated. Affiliated voters may change their status to unaffiliated or to another political party if they wish, although any such change must be filed with the state 55 days before the primary election. As of 2017, there were 2.4 million unaffiliated voters in New Jersey, more than members of any party in the state. New Jersey is a closed primary state. This means that only voters who affiliate with a political party may vote in that party's candidate selection process (i.e., the primary election). However, unaffiliated voters may declare their party affiliation up to and including the day of the primary election. Unaffiliated status does not affect participation in general elections. Following each decennial census, the New Jersey Redistricting Commission forms to realign the districts. New Jersey currently has 12 House districts In the 116th Congress, eleven of New Jersey's seats are held by Democrats and one is held by Republicans. ^ Klinghoffer and Elkis. "The Petticoat Electors: Women’s Suffrage in New Jersey, 1776–1807." Journal of the Early Republic, 12, no. 2 (1992): 159–193. ^ Connors, R. J. (1775). New Jersey's Revolutionary Experience [Pamphlet]. Trenton, NJ: New Jersey Historical Commission. ^ a b Leip, David. "General Election Results – New York". Dave Leip's Atlas of U.S. Presidential Elections. Retrieved November 18, 2016. ^ a b c "Political Party Resources." Division of Elections. New Jersey Department of State. 2010. ^ Arco, Matt (June 5, 2017). "Here's how you can vote in Tuesday's N.J. primary if you're an unaffiliated voter". NJ.com. Trenton, NJ. Retrieved August 16, 2017. ^ Hazan and Rahat, 2010, p. 40-41. This page was last edited on 15 March 2019, at 18:55 (UTC).